Free for Life - Never pay your cable or satellite fee for television again! You can get all local channels crystal clear and absolutely free! The 1byone antenna can pull in all of your local news, sitcoms, kids and sports programs. 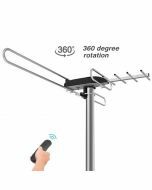 Simply connect the antenna to your TV using a coaxial cable, perform a channel scan, and in minutes you'll be enjoying your free local programs. The Best Picture and Sound Quality - You can now experience HDTV in the highest quality picture and sound available. Over-the-air broadcasts are transmitted in uncompressed full HD (1080P), ultra HD (4K) and 3D channels; far surpassing what cable and satellite offer. Many local broadcasts are digitally aired in Dolby 5.1 Surround Sound giving you the ultimate sound stage for watching live television. 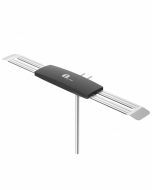 Included Mounting Pole and Built-in High Gain and Low Noise Amplifier -J-shape pole for antenna installation; super long distance reception up to 85 miles. Superior construction to withstand tough outdoor weather conditions. 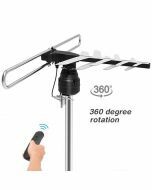 Receive Free Local HDTV, VHF and UHF Signals - Optimized for 1080P digital reception, the 1byone antenna allows you to pick up free local VHF and UHF high-definition and standard definition signals. 1byone Comprehensive Warranty - We stand behind our antenna 100% with a 12-month warranty. Please Note: Freeview reception is dependent upon environmental factors, we cannot guarantee reception in all conditions. We do offer a 30 day money back guarantee on all new items in order for you to test the suitability in your area. Is it easy to install? Are the installation instructions included? Very easy to install- the pole, mounting bracket, and even the two large screws were included. There was nothing complicated about any part of it. Only thing that was not completely straight forward was, as someone else has pointed out, the unattached half of the clamp that holds the antenna to the pole arrives backwards, but that's only a matter of unscrewing it and turning it around. How many tvs this antenna supports? I have it running 2 tvs with very clear pictures on each. You may have to changed directions for different channels. Mine is mounted on a pole, so I can turn it easily. With your stations only 13 miles away your results maybe different than mine. Most of my stations are over 20 miles and up. I found that while it is a very good antenna (which I love) I did have to adjust the direction to get the best result. I did spend $80+ dollars for an antenna that made claims it would pick up from all directions, it did not 11 stations. The 1byone 85 mile easily out performed it picking up 18 which is very good in my area. I rescanned late one night and it picked up 62 but the next day they were gone. Hope that helps.